Streams are often at the receiving end of rainfall (stormwater) runoff from land surfaces and local stormwater drain-pipe systems. Stormwater pollution, as well as sewage from leaky sewer lines and contamination from landfills, can shock a stream system for a brief period. 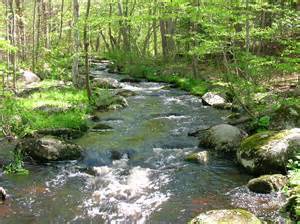 But if these influences are persistent and repeated, they can degrade streams and the aquatic habitat for insects, fish, stream salamanders, and other biological communities. Do your part to protect your watershed and stream for future generations. You can beautify and protect your property, defend clean drinking water, reduce flooding and drought, and help wildlife with simple actions. Avoid and control non-native invasive plants. Increase your garden area and decrease your mowing area. Raise your mower to cut at a height of 3 inches. Recycle your yard waste and use it as mulch. Manage stormwater using rain barrels, by planting a rain garden, directing runoff into vegetated areas, and other best management practices.